It has been said that cities are made up of neighbours who do not know each other. With this lack of knowledge, we sometimes feel lost and lonely, perhaps even insecure. We look for a place to belong. Elmwood Presbyterian Church offers that security, that intimacy and that place of belonging that finds its roots in Jesus Christ our Lord. At Elmwood, uplifting worship helps us confront the struggles of model life; you can find much to assist you in your own personal challenges. Relying on the power of the Holy Spirit, we proclaim the love and good news of Jesus Christ through our words and actions. As a reformed church, we rely on the truth and inspiration of Scriptures for God's guidance into the future-a future that we approach with wonder and anticipation, knowing God is with us. As worshipping communities joyfully celebrating the sacraments, we are supported, strengthened and equipped to share the love of God revealed in Jesus Christ. Our mission, in a world where many do not know the gospel, is to tell the biblical story in ever new and creative ways. Our mission, in a world wounded by sin, is to point to the redemptive work of Christ and the life-changing presence of the Spirit. Our mission, in a world burdened with anxiety and apprehension, is to provide a place of sanctuary, tranquility and renewal in the name of the One who said, "I will give you rest." Our mission, in a world where many are oppressed, excluded or ignored, is to call for personal righteousness, justice and reconciliation in the Church and in the world and to hear, respect and cherish all God's children. Our mission, in a world of limited resources, is to use God's gifts wisely and fairly for the good of all. Our mission, in a world of many nations, peoples, denominations and faiths, is to learn from one another and work together for the healing of the nations. In all times and seasons, we give glory to the God of all creation, to Jesus Christ, the Son, and to the Holy Spirit by whose presence all are blessed. 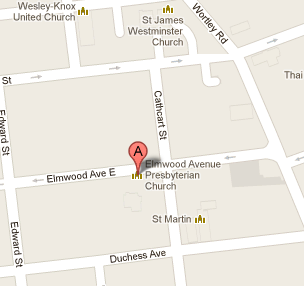 The history of the congregation of Elmwood is a long and interesting story. Many Presbyterians in Canada have their churches named after Reformers, particularly John Calvin (a Frenchman) and John Knox (a Scot who was influenced by Calvin's teachings). John Calvin (1509-1564) has often been called the "father" of Presbyterianism. Calvin lived in Geneva, Switzerland. From there, Presbyterianism spread through Europe. Calvin, like other reformers, worked hard to develop a church where everyone, not just the clergy, shared responsibilities. Schools were established to provide education for both clergy and laity. John Knox (1515-1572), after studying with Calvin in Geneva, returned to his native Scotland to establish Presbyterianism. It soon spread to northern Ireland, the United States and Canada. In 1875 several groups of Presbyterians formed a union and called themselves The Presbyterian Church. Our Church has been independent since then. Rev. 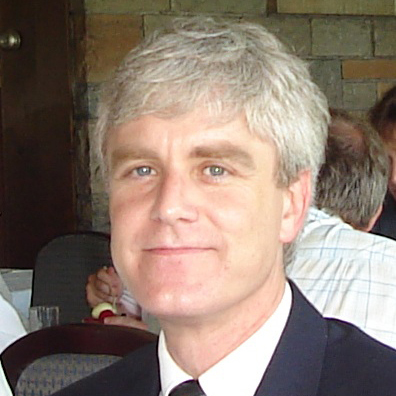 Dr. Andrew Fullerton, B.A., M.Div., Ph.D. In April, 2016, Rev. Dr. Andrew Fullerton was inducted as the seventh minister of Elmwood. 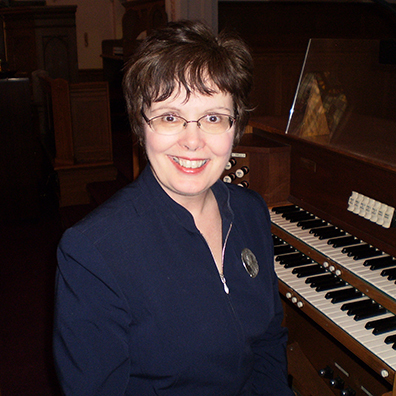 Lorraine Clark was appointed as Organist and Choir Director at Elmwood in 2009. She attended the University of Western Ontario, and received an Honours Bachelor of Music degree and a Bachelor of Education degree from that institution. She began her career as a music teacher at the high school in Aylmer, Ontario for 14 years. She later transferred to London where she taught elementary school music for another 16 years. Since retiring from teaching, Lorraine has combined her love of the church with her love of music, and finds much fulfillment in her work as Music Director. Lorraine believes that music is an integral part of every worship service. She also believes that church music should reflect the joy and depth of our faith in every anthem and hymn we sing, and in every instrumental piece we hear.